KAWASAKI’S 2014 KX85 is the latest in a long line of race-winning green minibikes which have been used by innumerable racers to launch successful amateur and professional careers. The under 12s are riding the small-wheel version, while kids as old as 15 can ride the big wheel. 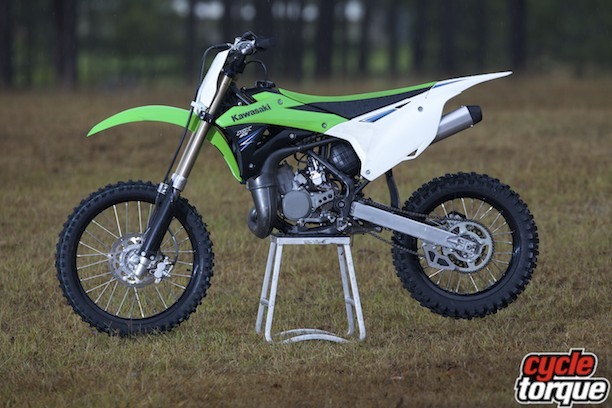 The KX85 is a high-performance, lightweight two-stroke engine hung off a simple, stiff chassis with good quality suspension, brakes and running gear. It’s a bike built for racing – it’s not for learners, for the timid or for paddock bashing. For 2014 Kawasaki is claiming 20 per cent more horsepower thanks to a new single-ring piston and changes to the KIPS exhaust valve, combustion chamber and cylinder head, while a larger radiator is there to get all the heat under control. The 2014 model has a flatter seat which makes moving around easier, and the handlebar position can be adjusted to six different places, which makes the bike easier to tailor for personal style and rider size. There are many other changes to the bike for improved reliability and the styling’s been updated to better reflect the factory race bikes – I’m not sure if that’s to help your junior racer believe he’s faster than he is, or if it’s to convince Dad that Junior is just a few steps away from a factory-supported ride, but hey, there’s no question the 2014 KX85 is a great-looking machine. Alloy frames haven’t made it across the board in the junior ranks, with Kawasaki staying with steel for the KX85’s chassis. Kawasaki claims its steel perimeter frame with centralised fuel tank (for a lower centre of gravity) results in a better-handling package for the KX85. The other big change for 2014 is the petal disc brakes, for improved performance and big-bike style. Small changes have also been made to the 6-speed transmission and clutch, but more for reliability than anything else. 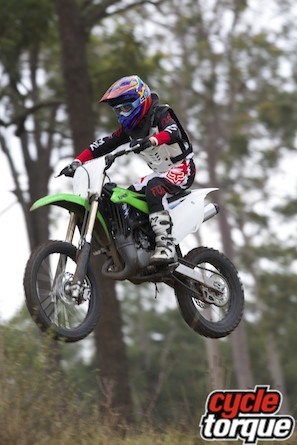 The 2014 KX85 is for the kid who wants to win races. There’s no doubt lots of championships will be won by riders aboard KX85s, although you really need to understand that although a kid will be on the podium, it will take a team – at least one parent and the rider – to put him there. The current crop of junior motocross bikes, especially the Kawasaki KX85, have proven themselves reliable by racing standards, but anyone new to the sport needs to realise these are highly-strung, high performance competition machines. They require pre-mixed two-stroke fuel, an almost zealous attitude to maintenance and the commitment to get Junior on to tracks often enough to come to grips with the narrow powerband (the range of engine revs where the motor produces useable power) produced by high performance, small capacity engines. Well maintained, the KX85 will be reliable, and are fairly simple to work on, at least for the Dad who knows his way around a spanner. Parts when needed are also quite reasonably priced. If you want to race one standard you can go for a full season without needing much more than a top end rebuild, and if you are searching for more performance out of the engine, it should still be reliable if the work has been done properly. The KX85 is for kids who have done their time either on smaller 65cc motocrossers or are wrecking their fun bikes on big jumps and trying to eke out the last horsepower of performance, and simply need something faster. On the other hand, many kids will be put off riding altogether if they try to ride an 85cc motocrosser before they are ready. 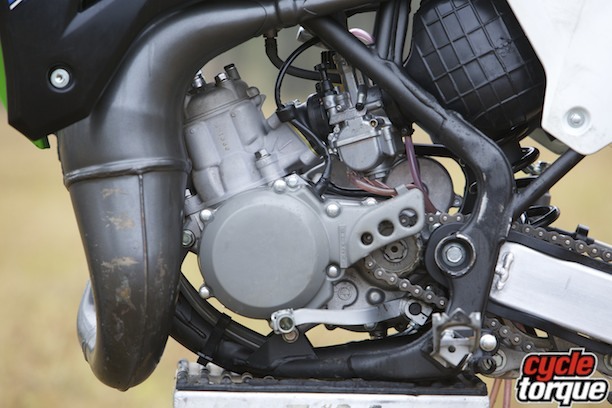 Modern two-strokes are more reliable and flexible in their power delivery. 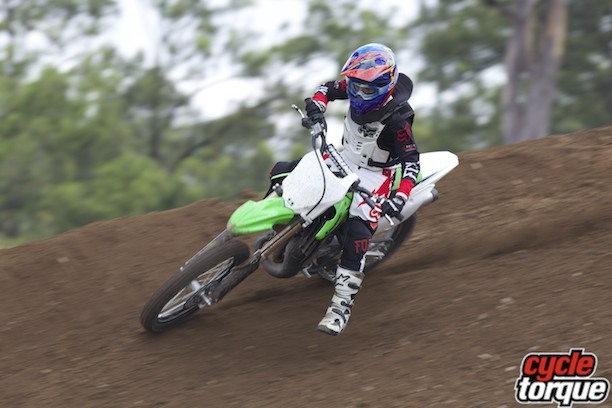 For those kids with the ability to ride a KX85 hard, they will be rewarded with the chance to experience the big jumps, high speeds and tight racing competition which is motocross in Australia. It’s a great sport which often builds pre-teens into confident, strong and talented young men and women – and sometimes they also go on to be champions. The big wheel version tested here costs $6699, while the small wheel version costs $6199.